With the Maximus IX Code, ASUS has a completely new motherboard in its portfolio, which is based on Intel's latest Z270 chipset. The front as well as the backside features a cover, which we know from earlier Formula series motherboards from ASUS. Apart from that there are numerous features to have a look at and we're apparently going to run our benchmark suite on this contender. Looking at the Z270 line-up from ASUS quite a few things have change compared to the past and one of those things is that with the "Code", there is an all new model. While it basically looks like the Maximus IX Formula there are a few features missing, like for example the VRM water cooling block. Let’s start from the beginning at this point. 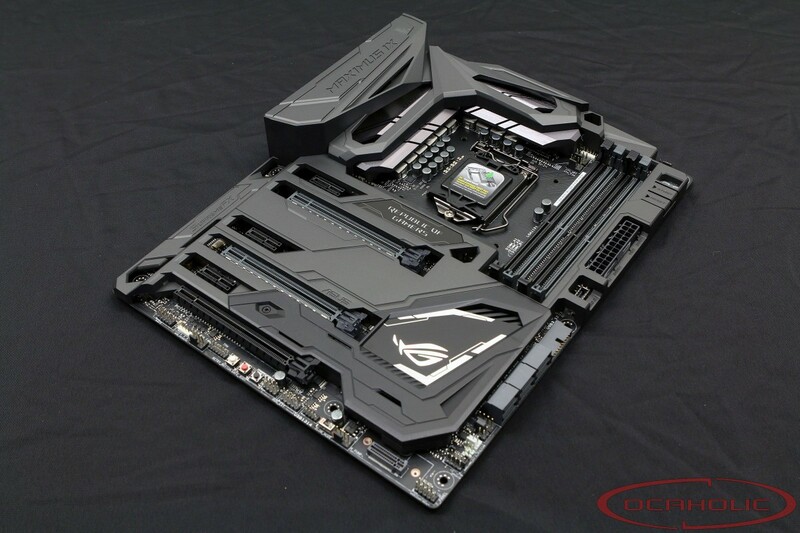 The Maximus IX Code has been equipped with ASUS’ "armor", which consists of a plastic cover on the front and a sturdy metal plate on the back. Apart from that there is the AURA feature, which allows you to change the illumination of the board from within Windows. There are also three full-sized and metal-strengthened PCIe slots, which have been wired using 16/8/8 lanes - top to bottom. Between the first and the second full-sized PCIe slot there are two slots distance providing plenty of room for graphics cards to breathe even in multi-GPU configurations. Removing the shroud we find a slightly altered feature set, compared to the Z170 models. Checking the SATA connector count there are six of them, while the previous generation high-end motherboards from ASUS featured either eight or ten of these connectors. What’s also not there anymore is the U.2 connector. Instead there are now two M.2 slots and both have been wired using four PCIe Gen 3 lanes. The positioning of those connectors is questionable. We’ve never been a huge fan of vertically mounted M.2 SSDs, since it doesn’t look nice and even if the supporting bracket is mounted it’s not too hard to break the board and the SSD. The second M.2 slot is hidden underneath a removable cover, which you really want to put back once the M.2 SSD is installed otherwise you’ll miss the nice PCH cover. Having this cover back in place will most likely lead to additional throttling issues with these drives. Looking for additional features we find the usual bells and whistles, like for example onboard buttons and a debug display, support for USB 3.1, high-quality power design and a bunch of connectors on the I/O panel. At a first glance this is certainly a good looking motherboard, although personally we’re starting to feel like we’ve seen enough plastic covers on motherboards. Nevertheless this will not stop us from having a detailed look at this board and send it through our benchmark parcours.